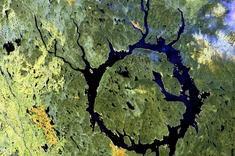 Our first lake-filled crater, Manicouagan in Quebec is one the largest and best-preserved crater on the planet. The 62-mile-wide (100 km) crater is 214 million years old. 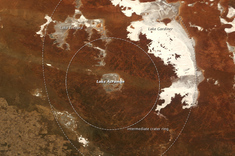 Lake Acraman fills this round impact crater, excavated 580 million years ago in South Australia. The crater measures 56 miles (90 kilometers) in diameter. Impact ejecta from the crater can be found in the Flinders Range 185 miles (300 km) to the east, among rocks with fossils of the first complex life forms on Earth. 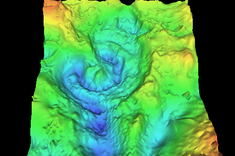 Buried under seafloor muds, Chesapeake Bay Crater offshore of Virginia is an estimated 35 million years old. 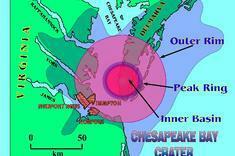 The curving western shoreline of Chesapeake Bay takes its shape from the 53-mile-wide (85 km) marine crater. A drilling core revealed the first hints that a large impact crater was buried beneath the bay in 1983 when the core brought up an 8-inch-thick (20 centimeters) layer of impact ejecta. Chicxulub crater's discovery clinched what was once a wild theory: that a meteor impact wiped out the dinosaurs. A thin layer of exotic iridium metal from a meteor impact had been detected worldwide at Cretaceous mass extinction before Chicxulub was found. Now, the meteorite that carved the Chicxulub crater in Mexico's Yucatan Peninsula is widely thought to have caused or greatly contributed to the mass extinction at the end of the Cretaceous 65 million years ago, including the end of the dinosaurs. 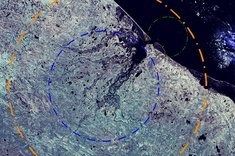 Some scientists think Chicxulub's original crater may have been bigger than Sudbury crater in Ontario. Estimates of its original diameter range up to 150 miles (240 km) in diameter and its current size is 93 miles (150 km). Kara crater is a 70.3-million-year-old eroded crater exposed in Russia's Yugorsky Peninsula. Researchers think the 40-mile-wide (65 km) crater was once more than 75 miles (120 km) in diameter. 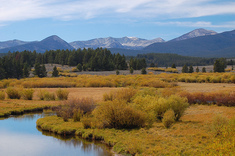 This 600-million-year-old crater spans Montana and Idaho and is the second-largest impact crater in the United States. Little remains at the surface of the 37-mile-wide (60 km) crater, which wasn't discovered until the 1990s. That's when shatter cones — cone-shaped, violently-shocked rock — were found in Beaverhead in southwestern Montana. The crater is centered in Challis, Idaho.